Here's a little fact about me, I am a huge Lisa Eldridge fan. I've been following her channel for years now, and she's the reason why I've been embracing more natural makeup for close to 5 years now. When she was named the newest Lancôme Creative Director I just about lost my marbles. I've always loved Lancôme, in fact my very first high-end makeup purchase was one of the iconic Juicy Tubes that every girl in the early 2000's had. Earlier this year many of the European based bloggers started raving about the newest Lancôme launch, the Juicy Shaker. As you can imagine, I wanted to get my hands on a Juicy Shaker really bad but I had to wait for the product to launch in the U.S. in mid-April. Now that I have one I'm going to let you know if they truly live up to the hype, or if they're a product you should skip. Here's my short review on the very cute Juicy Shaker! In the video you'll hear more about the product, see the packaging up close, and you'll also get a very quick demo on how to apply it. The Lancôme Juicy Shaker is a bi-phase lip oil with two distinct components. The first phase is a blend of five hydrating oils and the second phase is the pigment. Once you shake the little bottle like a cocktail shaker, you will mix the two phases together to create your lip color. 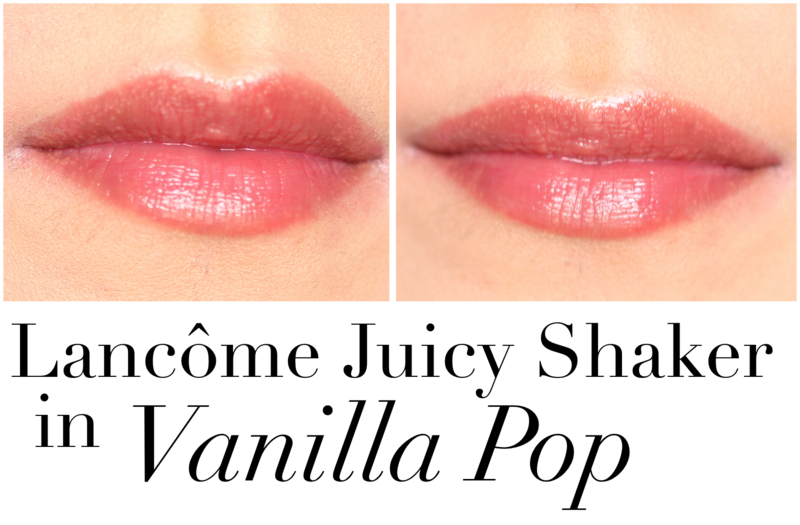 I picked up the Lancôme Juicy Shaker in Vanilla Pop which is described as a chestnut rose. I think this is a very sheer true rose color which layers up very nicely. All the Juicy Shakers will give you a sheer wash of color, which I personally enjoy for spring and summer. Are you interested in trying out a Lancôme Juicy Shaker? If so, which shade? Let me know in the comments below.